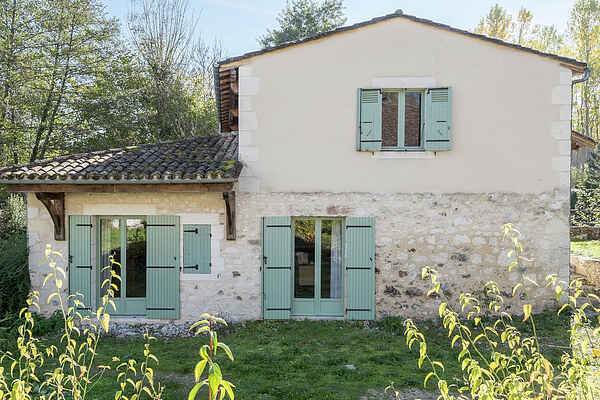 This elegant holiday home close to Conne-de-Labarde (3 km) was a watermill for many years. It is situated on a large property with a small river that meanders through it. Inside the house, part of the tiled floor has been replaced with reinforced glass panels so that you can see the river flowing underneath the house. The large private garden, with swing, sandbox and various seating areas, is a lovely place for the entire family to enjoy. The TV in the living room only works in combination with the DVD player. From your holiday home you will be able to walk straight into the woods, vineyards and fields. Saunter through the lovely village of Issigeac (11 km) or the famous town of Bergerac (11 km). The Place de la Myrne is a real must-see, with its lovely terraces and weekly market. You will also find a tobacco and wine museum. The region is famous for its wine. And you can sample direct from the many wineries, such as Château Monbazillac (10 km). Other lovely castles are to be found in Bridoire (10 km) and Baneuil (20 km). Treat the children to a visit to the water park in Le Bugue (45 km). And don't miss the old fortified cities of Monpazier (37 km) and Belvès (50 km).